Everybody knows when the Monterrey Sultanes & Tijuana Toros meet up on the field, sparks are sure to fly with the bad blood between these two clubs. Actually, it’s likely nobody in the states knows this at all, because these are two teams that play in the Mexican League. Last night, Toros infielder Jose Guadalupe Chavez collided with Sultanes catcher Angle Chavarin on a play at the plate and the collision got both of them heated. 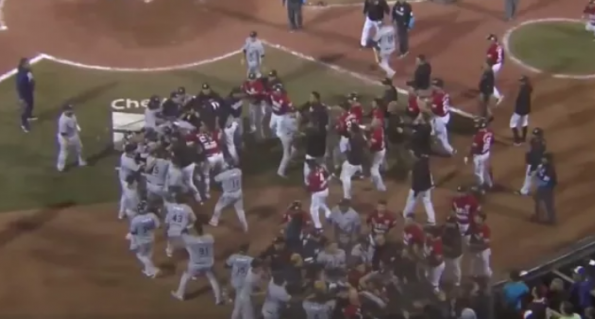 The trash-talk quickly escalated into an all-out brawl as benches cleared. In the midst of the fighting, fans in the stands began throwing beer and whatever else they could find at the players.